You should listen to this audio clip, and shudder over the “gospel according to Benny”. 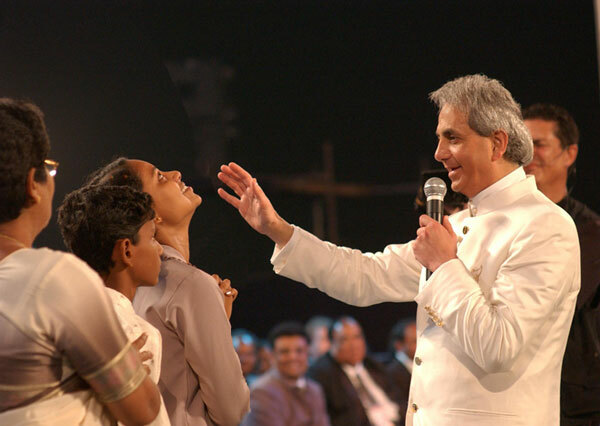 Benny Hinn seems to preach a different Jesus, than Jesus of the scriptures. This is a record of a gnostic gospel, a audio-tape with recordings from God.tv. 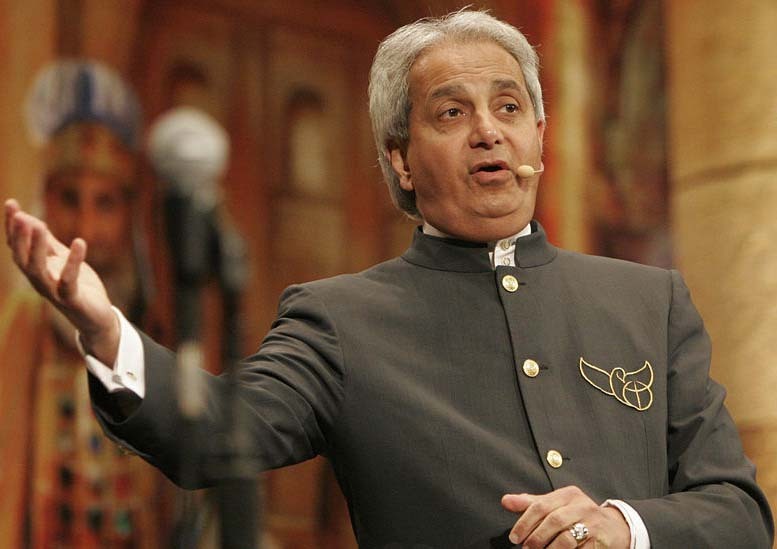 It is Benny Hinn who spoke these words on the first day of the present Mission week on the TV-channel. I have made a transcript of the audio-tape. Please read carefully. Jesus can not stand in front of a crowed and say: Once i was lost, but now I am found. He (Jesus) can not be a witness of His own blood. He can not look at the cross and say, look at me, and what the blood Has done for me. He can not be a witness of his own blood, of what the blood have done for him. The blood was not shed for Him. The blood was shed for you. He can not be a witness of His own power. There is no record of anyone getting saved before the cross. He (Jesus) talks about salvation being offered later. None of them were saved when Jesus walked the Earth. Nobody felt His presence either. Nobody. He preached to the whole crowed, and nobody said, I felt God’s presence. Except those who touched Him. Nobody got convicted by sin, when Jesus preached the gospel on the Earth. But after, the Holy Ghost came. 3.000 were convicted, later 5.000 convicted. Why? Because the Holy Spirit came to the Earth, to convict the people of sin. Jesus did not see anyone saved when He walked the Earth. Ho spoke about it, but nobody came and said He had saved them. The blood was not yet shed. It was not possible (Rorry). It was not possible (Benny Hinn). We can do more today, than what was done in 3,5 years. Then the day of pentecost came, and only that brought salvation to the multitudes. What Peter began, we are about to close. It began with Peter and the Apostles, and it is going to finish with Rorry and Wendy and a whole lot of us. It started great. Lets finish greater. If we blow this one, we will be judge severely. Do not let this man touch your forhead, and do not seak his anotintig. None of what Benny Hinn explains to us is recorded in the Bible. This man “Jesus” seems to be a great prophet, but can not save. Hinn rejects Jesus of Nazareth as savior. He deny the saving power of the blood shed on the cross. Hinn speaks about a separate salvation only available from the day of Pentecost. That salvation was not available before the day of Pentecost is a different gospel, preached by a man that is walking in a different spirit, and obviously present a different “Jesus”. This gnostic gospel recorded by Benny, is a gnostic gospel. It is a fiction, taught by a man who have been educated by an unclean spirit. Benny Hinn walks in the spirit of anti-Christ, rejecting the humanity of Jesus, that God has come to Earth in flesh. “Jesus can not stand in front of a crowed and say: Once i was lost, but now I am found”. Even on the cross, Jesus of Nazareth cried out to His Father in Heaven. God-Tv. spread this non sense of Benny Hinn out to TV-viewers all over planet Earth. Millions of people in more than 150 nations are being deceived, and lead astray. Please listen to this audio-clip. Gotta love the bible! And we must be careful how we hear and what we believe. We must judge everything by the word to know what truth really is. Matthew 1 vs20-21 : Clearly explains that Jesus is of the Holy Ghost, meaning HE IS. Also HE will save the people of sins. So if Jesus was born to save, as the Bible says, and HE is of the HOLY GHOST- and John 1 vs 1 and 14, clearly says HE is the WORD, was the WORD, became flesh and dwelt amongst us… Benny is not understanding the WORD of GOD correctly…JESUS CHRIST, GOD AND THE HOLY GHOST ARE ONE AND THE SAME PEOPLE..CATCH IT BEFORE ITS TOO LATE. Benny you’re not hINN anymore , you’re hOUT..stop messing with my GOD’S WORD. You will be punished. What is the power behind Hinn that cause healing thousands of people claimed? If Satan can cast himself as an angel of light, it would not be unimaginable that he can heal himself or others. Many false prophets walk this world, mimicking the Word of God, but serve the “god” of this world, the devil. Gloria you are exactly right. Satan and his angels that were cast out of Heaven with him can and do perform “miricles” every day. Remember Tom, they are angels even though they are fallen. They still have all their powers. THey can do anything except create life. He is not speaking Truth and if he speaks anything contrary to Scripture and says “thus says YHWH” (which is what he does as a “preacher”) then he is a false prophet A false prophet leading people astray can NOT be filled with the Holy Spirit because the Holy Spirit can never speak contrary to Scripture. So with all that being said, if he is not filled with the Holy Spirit what spirit is he filled with? He can only be working through and for one. If you are not for Me you are against Me. There are exactly two sides. YHWH and Satan. If there were actual healings then the papers would be full of accounts of them with the testimony of the doctors that had treated these people prior. Thank u for your comments. You speak the truth brother. Jesus keep you. Oh..You got it all wrong brother! There is truth in everything Benny said. Yes indeed Jesus can’t stand in the crowd to say once I was lost but now am found! He can’t. He can’t speak of His own salvation. He didn’t need salvation. He only came to show and give us a more excellent life.